'Tis the Season for Tech! 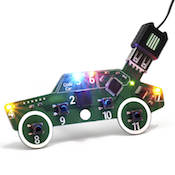 Maker Board is the perfect gift for that 'hard-to-buy-for' person in your life! 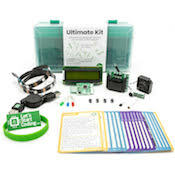 Our Starter Kit includes the basic electronic components you need to make over 10 cool projects. Using buttons, lights, and a speaker, you'll be creating something cool in no time! And we walk you through each project with handy cards that are included with each kit. Each component slides into a port. Then, you control it with code! Maker Board runs version of C++ that has some helpful additions for beginners. You'll type this code and learn about core coding concepts like logic and sequencing. 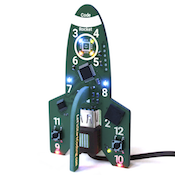 You'll also learn how to control circuits and components with your programs. But we don't tell you to read, we ask you to build! The learning will come through experimentation with our pre-written project code that you download. The organizations around the world that use C++ include Amazon, Facebook, Google, Microsoft, and NASA, along with hundreds of others. You can take your coding skills wherever you'd like. Let's Get Started! The Starter Kit is the perfect product if you have no experience with code, but you'd like to learn. It's less than half the price of similar kits and we've simplified everything for the beginner. All you need is an interest in learning code, an experimental mindset, and a couple of hours to get started! We provide over 10 cool projects, plus a walkthrough of each program and a number of resources to help you learn as much as you'd like while building cool things with code!